For A Good Time Call is a text-based intervention, designed specifically to take place in the public washrooms of every participating music venue during the NXNE Music Festival. 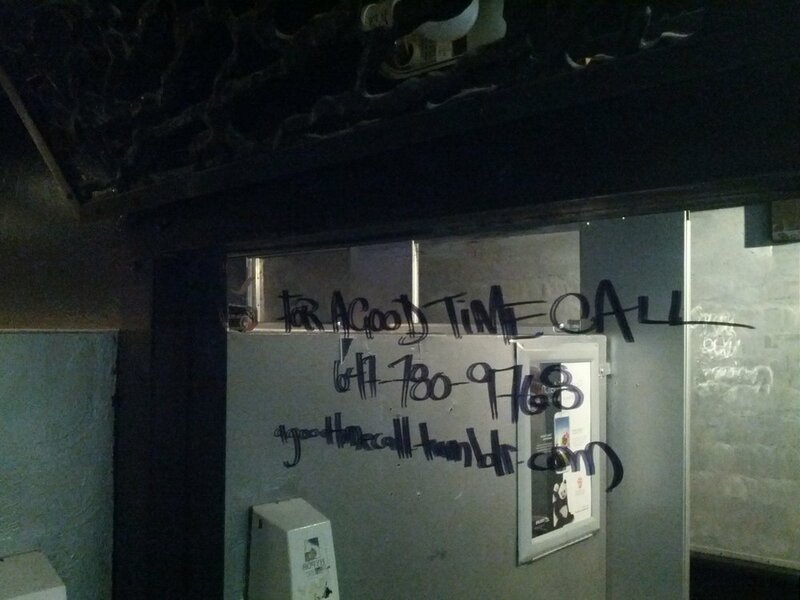 Written on every mirror was the text “for a good time, call”, accompanied by a temporary phone number and Tumblr URL. Upon calling the number provided, festival goers were directed to a voicemail message asking “How is your night?”, encouraging audience members to vocalize their personal accounts at the performance they attended. The voicemails left on this temporary number were continuously uploaded as audio files to the Tumblr blog throughout the duration of the festival. Playing archetypal graffiti formats, the project directs its attention to the idiosyncratic details of the individuals who populate the performances and support the musicians. While casual and capricious in appearance - and subsequently easily engaging - the project examines an unnecessary and complacently upheld binary between both public and private, and performer and audience. By utilizing the most personal space available in a public setting, everything from the introspective to the narcissistic or banal is documented. The Tumblr site hosting the amalgam of public feedback draws a snapshot of all the unnoticed components of what contributes to any cultural festival - the people who are attending and the causality of their attendance. Why are they there? How are they feeling? Are they there to support a particular individual or group? In what way are they interpersonally connected to the festival? *EQUΔLΔTERΔL was a Toronto-based artist collective, comprised of Emily DiCarlo, Jacqui Arntfield and W.J. Wilson, who created interdisciplinary projects with a relational, interactive focus between 2011-2017. Their projects required participation from the viewer, moving them from a passive role to one that is an integral part of the final work. With a preference for exhibiting in non-traditional spaces and making site-responsive works, EQUΔLΔTERΔL’s projects made appearances in streetcars, laneways, vacant storefronts, bars, parks, music venues and private homes.